It is a well-known fact that the concept of two-dimensional (2D) materials is a thought-provoking one. Humans exist in a three-dimensional world in which any observed thing has height, depth, and width. However, in the year 2004 when graphene, which is a carbon material distinctive in its absolutely flat, one-atom-thick composition, was produced for the maiden time, the thought-provoking concept came into existence and became an uninvestigated area in materials science. Pat Thiel and Michael Tringides, scientists at the Ames Laboratory, are investigating that area to find out the peculiar properties of 2D metals and materials grown on graphite, graphene, and similar carbon coated surfaces. Our work is somewhat of a miracle, if scientists can talk about miracles. Only a few decades ago, no one would have believed that we could see individual atoms, but our capabilities now not only allow us to see them, but manipulate them, like a child building with Lego® bricks. We’re able to create these materials from the bottom up, ones that could never happen in nature. 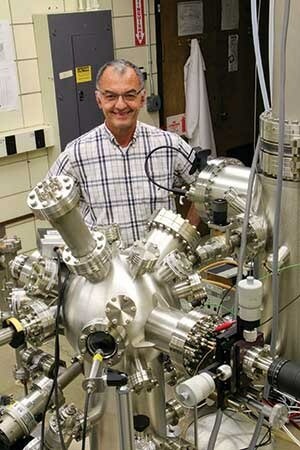 The 2D materials are developed under controlled laboratory conditions in an ultra-high vacuum ambience. Scanning tunneling microscopy is the technique used to investigate the materials. To eliminate all defects and impurities, the substrate is heated to high temperature. Then, intended atoms are deposited in succession from uniquely designed sources, once the substrate is cooled. Finally, the researchers tune the deposition rate and temperature to look for the Goldilocks-like condition, i.e. atoms move neither too fast nor too slow, such that a genuinely 2D material is formed. Although different types of surface materials are developed by various research teams in their research, one step is common in all the fabrications techniques: making an effort to enclose the assembly of the atoms within the 2D plane. However, it is highly challenging because this is in contrast to the natural tendency of the atoms to get assembled in three dimensions under most conditions. Atoms are chaotic by nature; we are fighting this randomness in everything we do. In our work, atoms are precisely arranged on a highly reactive surface in a vacuum. Every aspect of the environment is controlled. Our work is to fabricate very small, very clean, and very perfect. Working on materials in the nanoscale demands it. Hence it is more important to understand the behavior of these materials. Since 2D materials are only surficial and have absolutely no volume, we can attribute a range of peculiar nanoscale properties, such as chemical, optical, magnetic, thermal, and electronic properties, to them. Composing a rule book for properties of such materials is only the beginning to a larger objective, which is to develop tunable materials that can be probably used in a range of technological applications such as ultrafast catalysis, microelectronics, and spintronics. For the past four years, this has been the main focus of Thiel’s and Tringides’ research work of growing metals on 2D substrates, making the materials research carried out by Ames Laboratory more powerful. Tringides further added that the ability of the electrons to travel swiftly along the surface of graphene has provided it much dynamic attention not only in scientific research but also in the technological industry. However, in order to develop functional devices, patterns of nanoscale-size metal contacts, explicitly designed for performing a desired function, have to be formed on its surface. Whatever material we are trying to create, uniformity of the surface is the key to a functional device, and that is where our ‘perfect’ research comes in. That perfection makes us slow, but it’s a trade-off. If we can gain a thorough understanding of how these contacts can be produced under ideal conditions in a controlled environment, then these methods can be optimized eventually for commercial production and use. Thiel and Tringides were recently victorious in intercalating dysprosium onto graphite layers, i.e. introducing a material into compounds with layered structures. It is really very hard to achieve because the purely 2D surface of graphite acts as “slick” layers with no better way for bond formation between the layers. Nevertheless, the researchers have recently zeroed in on the conditions under which disparate types of intercalated metal-and-graphite systems can be formed by two-dimensionally bonding the sliding blankets of material together. This new technique seems to be propitious for forming a thin metal coat shielded by a carbon skin, and can thus ultimately result in the development of materials possessing peculiar catalytic or magnetic properties. Such a carefully focused and extremely controlled experimental interest in basic science might lead us to believe that the research work of the scientists, akin to their experiments, was carried out in a vacuum. However, Thiel attributes the achievements of surface science at the Ames Laboratory to the close cooperation between different research groups.